Prowling the Seas: Exploring the Hidden World of Ocean Predators by Pamela S. Turner. (Grades 3-6.) Walker Books for Young Readers, October 2009. Review copy provided by author. There are many different predators that live in the Pacific Ocean (sharks are among them, but far from the only ones). While we don't know a whole lot about many of these animals, we do know that their numbers are declining due to pollution, over-fishing, and other man-made causes. This is where the TOPP (Tagging of Pacific Predators) project comes in. TOPP aims to learn more about these animals by tagging them and mapping where they go. By knowing more about where these animals travel and congregate, we can help protect them. 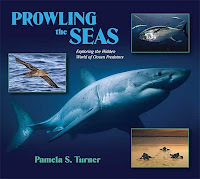 In Prowling the Seas, we learn about four different predators of the Pacific - sea turtles, bluegill tuna, white sharks, and sooty shearwaters (birds). The reader sees the entire process of tagging the animals and a map of where the animals traveled. Young biologists may be astonished to learn that these animals travel great distances (one of the sooty shearwaters traveled over 50,000 miles during a 10-month period!). How the animals find their way across the ocean and why they travel where they do are still mysteries that science has yet to solve. The text is accessible and will be interesting to future marine biologists and curious kids. And, c'mon, there's a big shark on the cover. This won't sit on your shelves gathering dust. It'll make a great addition to classroom units on sea life and conservation. Full color photos accompany the text, bringing these animals up close and personal. A list of further resources (books, DVDs, and websites) is included. Read more reviews at The LibrariYAn and Pink Me. And Happy Nonfiction Monday! Go check out this week's roundup at Wrapped in Foil! A little bird traveled over 50,000 miles? That is incredible. This sounds like one my science-oriented kids will love.